Drawing on earlier publications created by photographer and writer Hans Berger, the Buddhist Heritage Project, with the support of the London based Badur Foundation and private donors, has recently re-printed more than 23,000 copies of Berger and Khamvone Boulyaphponh's classic school book on the ceremonies and rituals of Luang Prabang. This was the 8th edition of "Thank You for Looking Here". In collaboration with the National Library of Laos the book was widely distributed to libraries and high schools throughout the northern provinces of Laos and the Vientiane capital district. In 2006 under the Quiet in the Land Art and Education Project, and in collaboration with the respected monk Pha One Keo Sitthivong / Khittiphatho and the National Library of Laos, Hans Berger published an acclaimed students' guide entitled "First Steps of Vipassana Meditation". This informative illustrated guide is now out of print, and there are plans for a second, revised edition in 2016 which it is hoped will also be distributed widely to schools throughout the country. Further we are developing a much needed Environmental Awareness Handbook which will reach out to lower secondary schools students in an effort to raise their consciousness of environmental and climate change issues so vital to us all. The cover of Hans George Berger's school book on Ceremonies and Rituals entitled "Thank You for Looking Here". Tens of thousands of copies were distributed to high schools across the country. 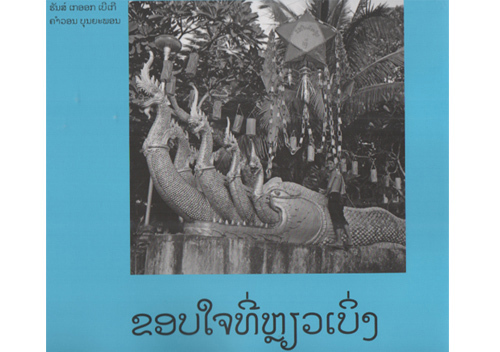 The cover of the Vipassana Meditation handbook for young Lao. An interior page spread from the Vipassana Meditation handbook for young Lao, indicating the correct positions, posture and movements to assume during Vipassana Meditation.